It would be just like the Cubs to hire a HOF figure head following another managerial tour of futility. Attendance is down considerably as Cub's fans are no longer willing to accept the long tired title of "lovable" losers. So why not placate them with Hall of Famer and fan favorite Ryne "Ryno" Sandberg? Lou Piniella's emotional, post-game press conference Sunday, following his final game, was indicative of the fiery passion he possessed for the game that fueled his intense desire to win. 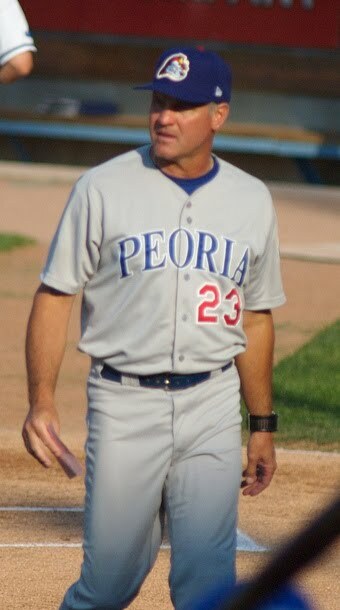 That passion is something that appears totally lacking in Ryne Sandberg who I have met on a few occasions. I came away from those experiences with the distinct impression that Ryno is your stereotypical mimbo. While it's true that Sandberg has spent the the last several years paying his dues at the minor league league level with the idea of being groomed to take over the Cubs' big league manager's position. To do so would be a disservice not only to Cub's fans but Ryne Sandberg himself. For starters, his managerial record isn't anything impressive, with a record of 276-269, this level of mediocrity mirrors what has bogged down the Cubs for years and is also a reflection of his bland vanilla personality. While the New York Yankees have hired and fired several former players over the years, including Sweet Lou himself, they have never, at least in my lifetime anyway, have had the misfortune of firing a Hall of Fame player. The saying that managers are hired to be fired is true and I don't know why the Cubs would want to put one of their own in that position to begin with. The team that Lou Piniella inherited, on paper, was capable of winning. They even made two straight playoff appearances under Lou's tenure only to be swept 3-0 in both years. Now I will be the first to say that Piniella mismanaged at least one of those series by not setting up his rotation properl, but the truth of the matter is that highly paid players like Derrick Lee, Aramis Rameriz and Alfonso Sorianio choked. General manager, Jim Hendry, has handcuffed this team with over-inflated contracts so severly, with the likes of Soriano and Koske Fukodome, that the current mid-season fire sale of Ted Lily, Ryan Theriot, and Derrick Lee is only a small step in a rebuilding campaign that will last for years. Is that the kind of team that we won't to hand over to one of the franchises most revered players, even if he is a shallow mimbo? I don't think so. I think if the Cubs plan on bringing up their young talent next year and not winning the whole enchilada, Ryno is a logical choice. He's been with most of these guys through out and for the most part they have performed well when called up. Either way, for Hendry to go on record and say Trammel won't even be considered is totally asinine! Think he would be a great coach but only time will tell. I stand corrected MattR. I forgot abut that.